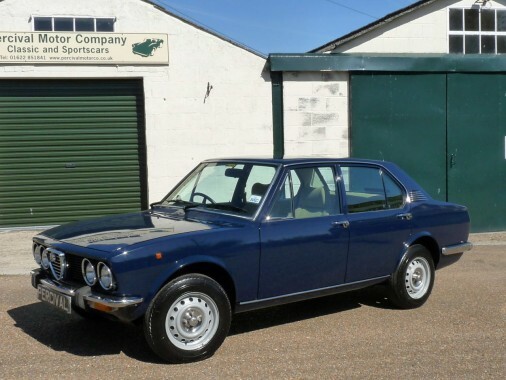 There are very few Alfetta saloons remaining and this must be just about the best, original example left. NEW PRICE We have changed the asking price significantly to attract enthusiasts who may have felt that we were a bit optimistic before! It has only covered 8,000 miles since new. It was supplied new by Motorway Sports Cars to a gentleman in Faversham, Kent, we have the original Bill of Sale and the brochure, and was pampered from new. He was of the old school and was very particular in the way he took care of the car. He had it Ziebarted thoroughly including the engine bay, although this is now removed revealing ‘as new’ paintwork, and apparently never put it away wet. It was very carefully stored when he stop driving. We acquired from its first owner five years ago and re-commissioned it and sold it on to the owner of the aubergine car that we also have. It went to Alex Jupe Motorsport for some final detailing and since spent time in a professional storage facility. It is in immaculate, original condition and as Alfa Romeo supplied it and even retains some of the protective plastic on the front seats.